This Spalding basketball is a replica of the official game ball of the NBA! Durable composite leather offers an incredible feel and grip that will withstand both indoor and outdoor play, letting your rule the court of your choice. 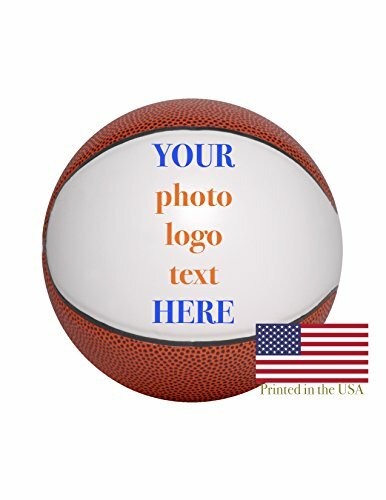 Full-size, double-panel basketball customized in any way you wish with team logo, photo, text, etc! What better gift for your coach than a custom double-panel basketball with team photo and players' signatures? Perfect for MVP awards too. Do you have a loved one that is a basketball fan? What is their favorite NBA team? Send a photo of them in their favorite NBA gear and we can print that photo on the basketball for them! Image is directly and permanently printed onto the surface of the basketball. We can add any photo, graphic or text to the ball. The imprint area on each panel is 4" x 6". Please upload your photo and/or text to us on Amazon. Stand included with purchase. Printed in Kansas and ships in 1 business day!What our customer's are saying! "Absolutely awesome, we love it and it will take pride centre place on top of our wedding brownie... thank you so much, great service and prompt delivery. ""Turned out great and arrived quickly!" 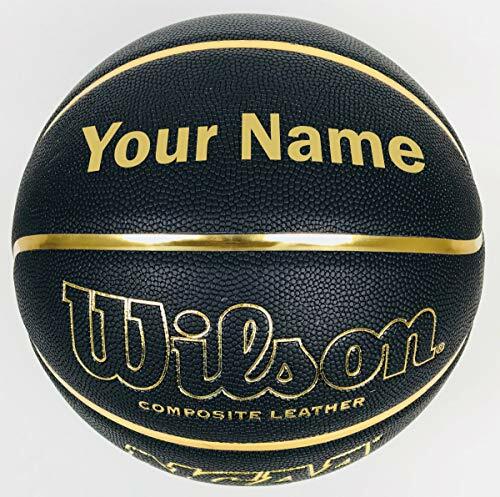 Wilson Customized Personalized NCAA Black and Gold Basketball Official Size 29.5"
Wilson NCAA Sensation Black and Gold basketball. This ball is the official size (29.5") used for men's high school, college, and the NBA! Your ball will be customized with any name or number you would like! 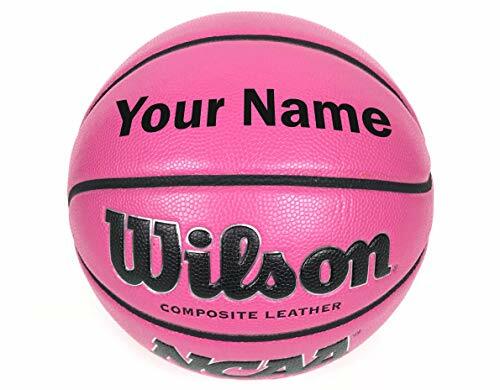 Wilson Customized Personalized NCAA Pink Basketball Size 6 28.5"
Wilson NCAA Pink basketball. This ball is size 6 28.5" and is used by girls and women ages 12 and up! Your ball will be customized with any name or number you would like! These are regulation personalized basketball. 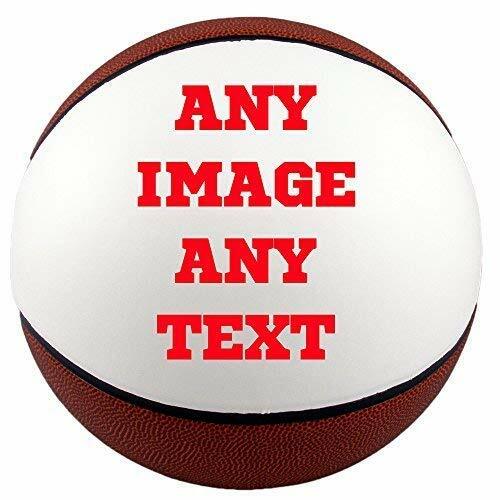 After you place the custom order, please send us a message and attach your image, logo, text or anything you would like on the personalized basketballs. 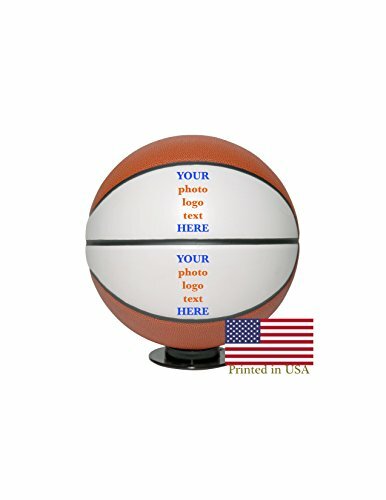 Once we receive your info, we will then create a mock up of the photo basketball and send it to you for approval before we imprint the personalized basketballs. 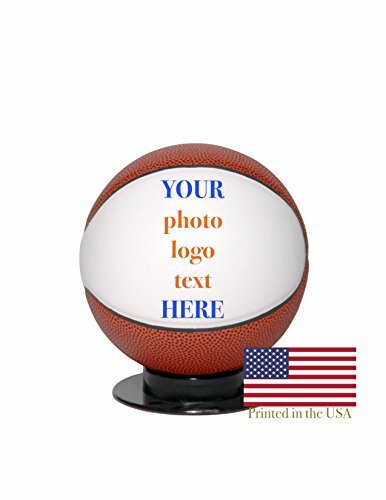 Mini 6 inch basketball customized in any way you wish with team logo, photo, text, etc! What better gift for your coach than a custom ball with team photo and players' signatures? Perfect for MVP awards too. Do you have a loved one that is a fan? What is their favorite team? Send a photo of them in their favorite team's gear and we can print that photo on the ball for them! Price includes one full color imprint in one location. Image is directly and permanently printed onto the surface of the ball. We can add any photo, graphic or text to the ball. Please upload your photo and/or text to us on Amazon. Stand included with purchase. Printed in Kansas and ships in 1 business day!What our customer's are saying! "Absolutely awesome, we love it and it will take pride centre place on top of our wedding brownie... thank you so much, great service and prompt delivery. ""Turned out great and arrived quickly!" These mini personalized basketball is 6" in size. 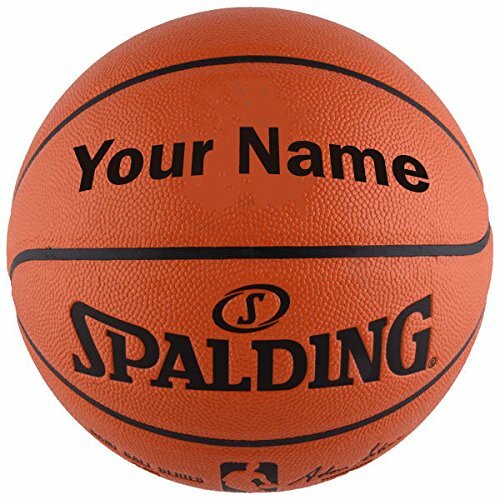 After you place the custom order, please send us a message and attach your image, logo, text or anything you would like on the personalized basketballs. Once we receive your info, we will then create a mock up of the photo basketball and send it to you for approval before we imprint the personalized basketballs. Full Size 12 inch basketball customized in any way you wish with team logo, photo, text, etc! What better gift for your coach than a custom ball with team photo and players' signatures? Perfect for MVP awards too. Do you have a loved one that is a fan? What is their favorite team? Send a photo of them in their favorite team's gear and we can print that photo on the ball for them! Price includes one full color imprint in one location. Image is directly and permanently printed onto the surface of the ball. 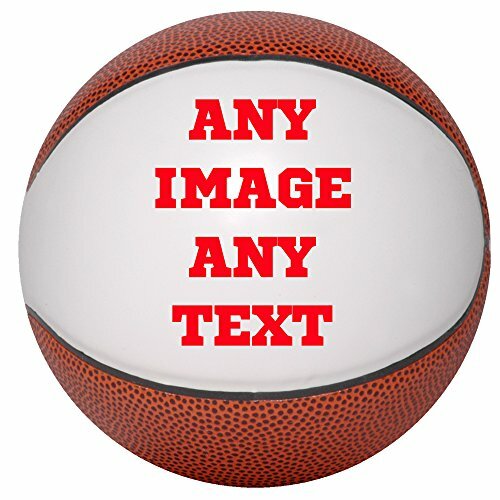 We can add any photo, graphic or text to the ball. Please upload your photo and/or text to us on Amazon. Stand included with purchase. Printed in Kansas and ships in 1 business day!What our customer's are saying! "Absolutely awesome, we love it and it will take pride centre place on top of our wedding brownie... thank you so much, great service and prompt delivery. ""Turned out great and arrived quickly!"